D F Custom Embroidery offers all types of custom embroidery and gift shop items including Live Free or Die T-shirts, sweatshirts, jackets, caps, aprons and bags. Offering our own line of New Hampshire embroidered designs including landmarks and wildlife of our state on all types of gift items or clothing. We embroider and garment print for the retail or wholesale customer. If your needs are on a wholesale level, our expertise in product counseling can help you create a special line of products for your gift shop or for your corporate needs. Our designs can include embroidery, applique embroidery or tackle twill, diamonds/nailheads,even glittering. We offer a line of Live Free or Die designs which include leather applique embroidery within a selection of appropriate designs. A gift line for any occasion!!! 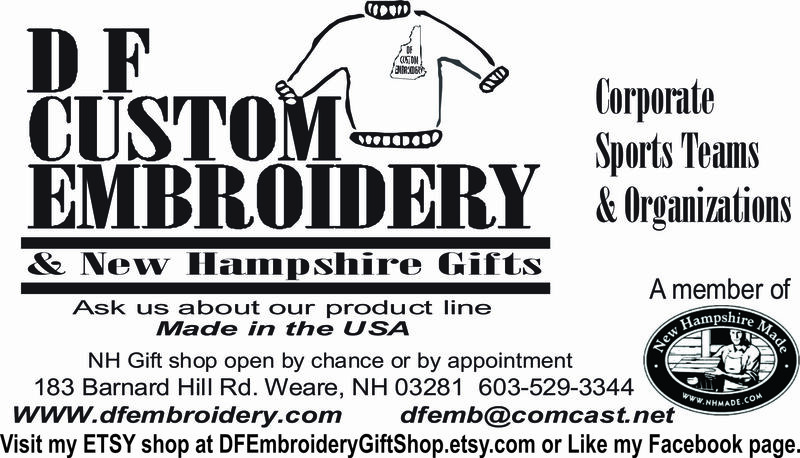 Call us for more information at 603-529-3344, visit us by chance at our NH Gift shop in Weare, NH or call for an appointment or you can visit us online at www.dfembroidery.com.